It's a mashup of their song "My girls" with Frankie Knuckles "your love" since they both kind of have the same synth melody. so that reminded me that I did this mashup/re-edit thing with the same song a couple of years ago except i put Justin Timberlake and Britney Spears over it. enjoy!
" MY Girls " .... is pretty amazing solo. Lets not forget about the major classic version from The Source Feat Candi Staton called "you got the love". The song used the same Jamie Principle/ Frankie Knuckles jawn, but had Ms Staton singing over it... and let me just tell you the shirts come off to this house classic. Sending to fellow FF, cuz not everyone should own this. yeah it was definitely in GTA3. fun fact: did you know that Tim Sweeney did the music licensing for that game? Did you know that... BLARP! I really like "Our love" but, the singer looks like a homeless or something else. And, I've a question for you... why you talk abut Britney? She isn't a singer. thanks a lot for the informative article. i am really interested to read more from you. nice mashups and good album! I am not much into reading, but in some way I got to learn decent info on your site. Simple to see and helpful. We will look forward for your future updates. Thanks! . Thank you everyone from the comments.If you don't mind passing this story along to anyone you'd think you'd like it I'd greatly appreciate it. Lovely piece of music. What is with the outfit. Are you out to scare kids? There are some unexpected thing i know to read this blog and the songs are also nice. I really like "Our love" but, the singer looks like a homeless or something else. Its great.... Very happy to be visiting your blog. Great! Thanks Very much! Thanks for the input about this topic! Good to help us get our facts straight. Nice blog. I will keep visiting this blog regularly. Good job.... I am happy to be visiting your blog. Great! Thanks Very much! I really enjoy reading the post, thanks for sharing I really like it. I appreciate the blogger for posting the most excellent thought. Thanks. really very funny and enjoyable,four men with mask looking great. These articles are fantastic; the specifics you show us is interesting for everybody and is really wonderful written. It’s just outstanding! Lets not forget about the major classic version from The Source Feat Candi Stanton called "you got the love". The song used the same Jamie Principle/ Frankie Knuckles jaw, but had Ms Stanton singing over it... and let me just tell you the shirts come off to this house classic. Sending to fellow FF, cuss not everyone should own this. Animal Collective is an experimental psychedelic band originally from Baltimore, Maryland, currently based in New York City. 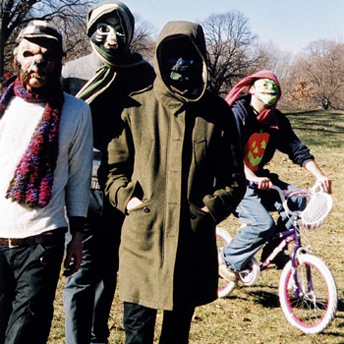 Animal Collective consists of Avey Tare (David Portner), Panda Bear (Noah Lennox), Deakin (Josh Dibb), and Geologist (Brian Weitz). I am very happy to have found a genuine seller who can be trusted. I purchased a generic product which has had excellent results. I will be back for more. Thanks. Really solid article you've wrote here. Tweet the Meat sounds like a great service. Thanks. This is what I need to know very much. I appreciate you to sharing this post with us. Hey, I just hopped over to your site via StumbleUpon. Not something I would normally read, but I liked your thoughts none the less. Thanks for making something worth reading. The post is absolutely fantastic! Lots of great info and inspiration, both of which we all need! Also like to admire the time and effort you put into your website and detailed info you offer! I will bookmark your blog! Such a wonderful post. Thanks for sharing. Keep posting. I follow you. Nice mashups. Thats is very intersting nice posts. Nice blog, This impressive information like each reader. Thank you! Our Love is enjoyable. I definitely like it since I hear it a years ago. This song reminds me on someone who I love. Great post. the information is very nice, complete, interesting and useful. You have done an excellent work in here. Congratulations! Wow..that was really neat way of putting it. Excellent!! Vermox Online compliments. Always wondered as to how this would really be. clomid Online have really put across the point so well that you have made number of things quite clear. Of course will have to go through it properly a couple of times to actually gauge, but as of now I totally agree with your sentiment. i wanted to thank you for sharing all this wonderful information with the online community. Great information !! !thanks for sharing this with me.In fact in all posts of this blog their is something to learn . your work is very good and i appreciate your work and hopping for some more informative posts . Again thanks for sharing. I’m pretty new to your blog, but am enjoying what I have read so far. This post particularly caught my attention. I have read your post thoroughly and got mind blowing information.... Please send me mail if your are going to improve something advance.. Thanks.. I'd like to actually be more a part of this blog and know what great things you have to offer I think if you write more original blogs like this you can improve the website. cool looking mashups to be sure thanks for the posting. i love to read this topic and also get the some valuable knowledge.. I am very thankful to share this post.. I hope you have more information about this post.trade show exhibits. So, Please share me.. Thanks.. It is very useful information for every one. Nice post, I would like to request you to one more post about that Keep it up. This is really great. I like to be visiting your blog.you have a great mind of thought.. Thanks very much for sharing all this great information here. Like your blog and respect your great work..Keep it up!!! Awesome album! Absolute fantastic. Thanks for your post!!! It was very useful for me. Keep sharing such ideas in the future as well. This was actually what I was looking for, and I am glad to come here! Thanks for sharing the such information with us. Great post!I was in searching of this type article.Now I am very happy. Thanks for taking the time to discuss this. I really loved reading this post. Terrific post, I’ve bookmarked this site so hopefully I will discover much more on this topic in the foreseeable future. Thanks for sharing. Great information it very useful an informative. It is better to deal with this subject like you did instead of beating around the bush. I always like direct articles. Thanks for that great stuff! This is my very first time I have visited here. I discovered a lot of interesting information in your blog And I will thank full to you. Thank you for sharing this new development information ... It's really amazing and I give much information ... Share more me ... is really good. I hope you have more information on this article ... .. Thanks ..!!!!! A very interesting blog You've some quite interesting posts.. Thank you for sharing so great thing to us. Thanks for the info. This is exactly what I was looking for. I am currently researching this topic so I will be back. Wonderful site and I wanted to post a note to let you know, ""Good job""! Thank you for sharing this great information. To maintain one of the details of a publication to be expected, information about the commitment of each picec future. I love a great job. I read a great effort. Oh my god, how much information can one post be consisted of. Damn so much to talk about and so little space. I should tell it in general point of view, everything presented above the comments was fantastic. Really is it beautiful. The author of this site very hard work, is completely this website useful information really I read... Thanks for sharing with me. All Seasons air conditioning hire, the widest and most flexible choice for portable air conditioning. Our air conditioning hire fleet is one of the largest modern and reliable in the industry.